I have to say I LOVE the simple and clean graphics. However I feel that the rotating options make is hard to know where your ship is as many people use the shot stream as an indicator when playing danmaku games. Also as said before the enemies should be easier to kill off. It's only important that the enemy delivers their shots before being destroyed, they don't really have to stay around because of high HP. Again just some thoughts. Great concept it's very clean and fresh. However I feel that the rotating options make is hard to know where your ship is as many people use the shot stream as an indicator when playing danmak games. I tend to agree with this... love the game, but there were a few times when I got the equivalent of shmup vertigo. I thought my ship was moving, when in fact it was the rotating filament. Acutally, Linley, I’d just keep the enemy-to-ship collisions TOTALLY out of there period, given how manic this game is in the first place, you know? I mean, I truly enjoyed getting up-close and personal to the enemies and blowing the very hell out of them with impunity, which I ABSOLUTELY DO LOVE!!! d= =b And also, I think some of the weapons could use a wee bit more balancing for the final compo version. Plus if you can, could you please add a continue feature plus a limited amount of continues to use per new game (like three (3) continues, at the most! ), hmm? Other than that though, this is *really* shaping up to be a MOST EXCELLENT contest entry, my awesome man!!! !! - The weapon system is supposed to encourage the player to choose weapons with complementary functions. Because of the way the weapons level up through use, if there was one weapon which was good in all situations the player could just kill everything with that and forget the other two. This is why, for example, Vapour Orb does about three times as much damage per unit time as Sunshower - if they were comparable you could get away with using Sunshower for everything. brog said: don't completely decouple them, but have them faster than they are now. like, for each additional weapon recharging, 25% less charge is added per time step. I'm considering adding a choice of ships. One will be like the ship is now, where when using one weapon it works at 100%, with two they are at 50% each and three are at 33% each. The others could be, say, 80%/65%/45% and 60%/60%/60%. Just a thought. brog said: finally made it to level 2, and it's visually confusing: the fire/explosions are the same shape as enemy bullets and a brighter colour. monoRAIL said: My gamepad didn't seem to work - I have an Xbox controller with USB adapter using the XBCD drivers, it didn't respond in the menu at all and the calibrate joystick didn't seem to do anything either. However, it worked fine with joy2key. I guess Allegro doesn't recognise those drivers. Oh well. I haven't implemented joystick control for the menu, though, because it doesn't really lend itself to analogue input and I don't have a gamepad with a digital pad to test digital input on. Pixel_Outlaw said: Also as said before the enemies should be easier to kill off. It's only important that the enemy delivers their shots before being destroyed, they don't really have to stay around because of high HP. Destroying enemies is supposed to be a challenge because of the way they level up the weapons. Adigun A. Polack said: Plus if you can, could you please add a continue feature plus a limited amount of continues to use per new game (like three (3) continues, at the most! ), hmm? I'm not sure. Continues always seem to me to be an arcade game thing which is out of place in PC shooters. Instead GoCL sort of deals with this by giving lots of extra lives (each 2,000 points) which will come a bit faster when I get around to making the bosses give you points. Not sure how I let that one slip past my fine-toothed QA efforts. Olick said: This does lead to me wanting to pick a weak weapon for spam shooters, and a nice, strong one for the stronger enemies, making me choose a balanced set instead of an unbalanced one. monoRAIL said: Oh, and the rear-firing seeker one is very weak I think. It might be better if they lasted a little longer before they self-destruct. Hm, maybe the worms are a bit weak at the beginning. They come into their own in stage 2, though. Got to run... bus to catch. Nice game and very unique! Music and sounds are cool. I like the graphics, only the backgrounds could be a bit darker for better contrast. I only reached level 2 . The leveling up could be a bit faster. I mostly used weapons 1,2,4 and 6. Weapon 5,8 and the missiles are maybe a bit too weak. Try reducing xspeed and yspeed to 0.7 when you fly diagonally. I think this makes the ship movement more precise! And there is a problem with the framerate. All movements and the scrolling look a bit jumpy. I have a widescreen monitor, so everything on the sponsor screen was stretched out. Then, after it faded, the screen went blank. But when I hit Z, I got to the weapon selection thing; except I could only see the text. I didn't bother to continue. Sorry about the banners, it didn't occur to me to put them all on the same image when down sampling so they'd share the same pallete. I have no issue with what you've done with the banners since its what I should have done in the first place. I played again to see the second level, and I must say I really liked it. I have a few gripes, though. The homing missiles seem to be absolutely useless with the short range they've got, and the bullets on the second level are a bit poorly shaped, as they blend in with the fire graphics from explosions and exhaust from the enemies' engines. 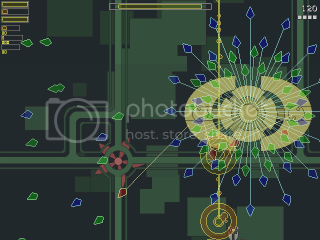 The first level's bullets would fit better on the second level, as it'd be easier to pick out something with straight lines among all the circles. I also think the (lack of) transition between the levels was a bit of a let down. And finally, the evil buggers that kept flocking at the bottom of the screen were quite a pain. The screen was easily flooded with enemies and bullets because of their difficult positioning. 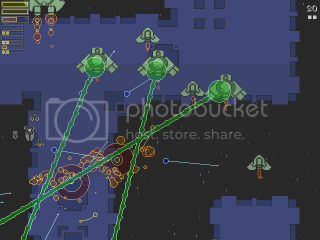 In combination with the targetting laser ships, it got very frustrating. So I've just attached the provisional final version of Garden to the first post in this thread. - All sorts of crazy fun with palette-shifting. This is what 8-bit is good for! - There's also source code, if anyone's interested in that. I just remembered that I have to cycle home from the Internet cafe before it gets dark so I won't be able to write as much here as I wanted to - in particular I wanted to reply to the comments above. Oh well, I'll be back again tomorrow. Cool that you included the source. But biking in the dark is pleasant! Unless you don't have lights I guess. Show general stats for avatarkai. I love what you've got so far. The styles of the two levels might seem very similar judging from the screenshots, but seeing them in motion makes a big difference. Well, there were some minor issues with version 1.0. All trivial but I decided to update it anyway. Version 1.01 is attached to the top post. Now, to reply to some of the earlier comments. The 0.7 thing has been in there from the start, so maybe you're noticing the lack of inertia? I'm not sure. If you're having trouble with the framerate, I suggest playing in fullscreen with vsync off. If that doesn't work I'm not sure what's going on, sorry (because this game is not very demanding on system resources). Sounds like Allegro may have trouble with your video drivers. Did you try windowed mode? Edit init.txt to set it. The homing missiles seem to be absolutely useless with the short range they've got, and the bullets on the second level are a bit poorly shaped, as they blend in with the fire graphics from explosions and exhaust from the enemies' engines. The worms have been given a greater range, but they're not supposed to be a replacement for the first three weapons. A better use for them is to fire backwards when you're forced to the top or sides of the screen, and against the nasty enemies in level 2 which come from behind. Stage 2 bullets have been made a lot more distinctive. I have no issue with what you've done with the banners since its what I should have done in the first place. Thanks everyone for the comments! I really appreciate it. Even though the final version is in I'd still like to hear what people think of it. Hmm, maybe the ship was a bit too fast for me to notice. The control in the new version is perfect. I like all the changes! At first i thought you made your game too easy but the second boss showed me its not. The framerate is still jumpy, but not much. Its not slowdown, it looks like the fps jump over the limit every few frames. I love this game. I was playing it today instead of working on my own game! Show general stats for InfectedZero. With regard to the worms in vbeta2, I thought they were a little weak at first because I was used to vbeta1, where they were probably overpowered and it was possible to fly to the top of the screen and rely on them, only using the smoky cannon for the big bastards. After playing vbeta2 for quite a bit, I realised that I was being forced to use my other weapons much more. Something which became apparent which was very cool, was that I started developing combos to bring down some of the mid-strength enemies. I'd spray them once with the quick weapon, and then close in behind them for a broadside salvo of worms. I found my worms actually did level once I did this. Going to download the complete version 1.01 and see how things are. Well, the polish on 1.01 makes such a huge difference. I love the special comment you get whenever your multiplier increases. I got distracted at least once in level two or three (probably in both, actually) trying to read what it says, and dying as a result. Level two was frenetic; and the pulsating background of level three nearly induced an epileptic fit. Im in stage 3 now. The enemies that cover the whole screen with bullets always get me . Can you please include the slow function for gamepad into the next version? I suggest button 5,6,7 or 8. And i think the 0.7 diagonal speed only works for keyboard. Heh, you know what? I think I must have written the joystick code when I was mostly asleep, because you're right. Thanks for pointing it out! fixes the third boss, which was spawning too many little friends on Normal level. So nothing earth-shattering, but there you go. I've also added to main.c some optional code which was kindly supplied by Thomas Harte on the allegro.cc forums. It's for systems (such as Unixes, some setups of OSX and certain configurations of Windows Vista, and maybe others) which forbid applications writing to their own directories by default as a security measure. So if you find that high scores and key settings are not being saved, look in init_at_startup() in main.c and read the instructions there. It's not active in the Windows binary as I haven't tested it and nobody's reported any problems yet. WOW, just WOW. This is the best - if not the best - shmup i've ever played. I simply loved the theme. I mean "Garden of Colored Lights" must be one of the only things that haven't been though of 100 times over in shmup development. I really liked how the options rotated around you, instead of the usual snake train movement. The game has no glitches(to my experience), and it ran completely smooth. 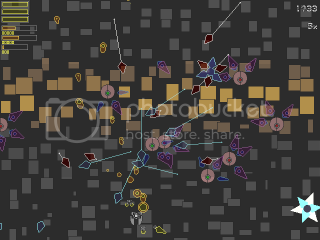 I'm curious though, how you could do the poly-merging like you did in your game in GM. I might research the subject a little. But i have no idea how. Although, those might have just been sprites in your game, which i don't doubt at all. (not as an accusation though.) Did you make a system for the poly-merging blast effects? Or use sprites? I'm curious. Those there are a great triple. For small enemies, and cluttered situations, use the solar bite. When forced to the top of the screen, use worms. And, when facing a big enemy. I like to use a small combo i made. Vapour orb, worms from behind if possibly, back to front, repeat until dead. This game's strategy needed is immense. I JUST beat the stage 1 boss on normal, ugh. The Stage 2 enemies are hard and i died in about a minute. Those there are a great triple. For small enemies, and cluttered situations, use the solar bite. When forced to the top of the screen, use worms. And, when facing a big enemy. I like to use a small combo i made. Vapour orb, worms from behind if possibly, back to front, repeat until dead. I like to use the Tooth of Xom(who's Xom, anyway? ), Sunstorm, and the Vapor Orb. Basically I just spin the tooth and weave around if it's just a swarm of one-hit kills, use the Sunstorm if there are stronger enemies whose shots I want to dodge, and I use the Vapor Orb on bosses and minibosses. I usually try to stay near the bottom if I can. The god of chaos from Linley's roguelike. That game looks quite interesting. I really must play it. Hm, I don't know anything about GM so I'm not sure whether you could get the same result. I did it by hacking Allegro's 256-colour transparency thing a bit. Normally the transparency functions give you a blend of the base colour and the transparent colour, but Garden does it like this: there are 12 base colours, then for each of the transparent colours (yellow bullet border, yellow inside of bullet, blue border etc) there is a set of 12 base colours with the transparency applied. 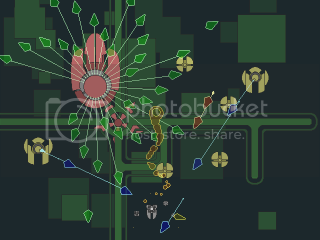 The transparent colours are sorted into a hierarchy with higher colours alway overwriting lower (and never being overwritten) and bullet insides overwriting bullet borders - this requires a customised colour map, which is easy for Allegro. When two polygons of the same colour merge the inner part overwrites the outer part so it looks like just one polygon with a continuous border. The transparent graphics in Garden are a mixture of primitives and sprites. Hope that made sense. If you can manipulate the way transparent colours are drawn in GM you should be able to do this as well. Probably needs to be in 8-bit colour, though. Certainly is! I was wondering if anyone here had heard of Crawl :) By the way, the new and improved Crawl (including a just-announced update of the graphical version which I must download to look at) is here. I haven't worked on it for years, though. Certainly is! I was wondering if anyone here had heard of Crawl By the way, the new and improved Crawl (including a just-announced update of the graphical version which I must download to look at) is here. I haven't worked on it for years, though. That's how I came across this forum, in fact. 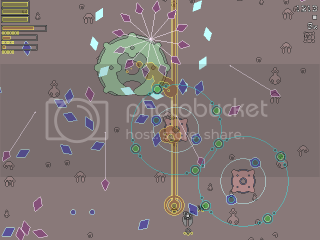 Crawl -> Excellent Bifurcation -> SHMUP-DEV. Wow, i've been playing a bit more. And i got almost a level 7 sword(6 bars, exp bar 3/4 full) at the beginning of the second level i died. But WOW, try going through entire game with using JUST a sword. Hehe, that was so awesome, try it! Yeah, sorry if that was kind of confusing but it's a little difficult to explain. serprex's explanation of writing the images in layers is probably the way to do it - it might be slower depending on how many layers you use but it would also be more flexible in some ways (and would work in higher colour modes). Cactus seems to have done something like what you're looking for in the smoke clouds in Minubeat, which is done in Gamemaker. We were having this discussion elsewhere as well. Make a sprite with the outline and fill as separate frames. One object that draws the outline of the shape at a depth lower than the object that draws the fill. This way the fill layers will look like they merge and the outlines would be at the bottom, and the intersections would be unseen due to the fill layer. Btw linley, remember to claim your prizes if you haven't already! Hey Linley, still waiting to hear from you. Get in touch as soon as you can so I can get the ball rolling on getting the prizes for everyone. Wow, i feel like a complete idiot. I NEVER thought of it like that. I'm really used to drawing the outlines above, i completely forgot that. Thanks Kairos. How about a level selection if you have 4 levels that last easily 10 minutes and you die fast? Or at least have a save function. to the [Misc] section of init.txt, where 2 is the stage (2-4) you want to go to, and you can play that stage as much as you want (although only that stage). Weapons in Tourist mode are probably not as strong as they would be if you'd gone through the previous stages, though, and of course you start with a 0% multiplier. Why didn't I mention this earlier? Because I derive enjoyment from the suffering of others.